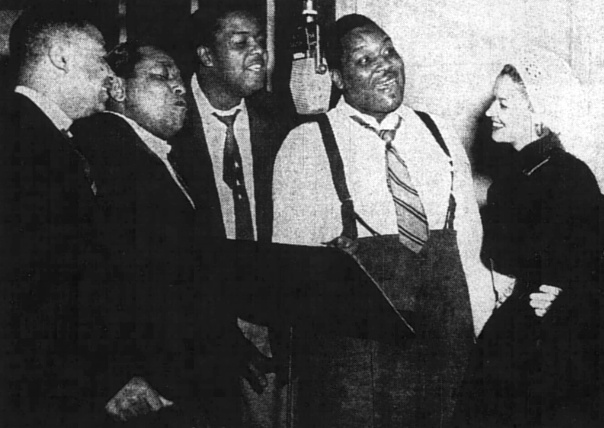 I Hear You!The Du-Droppers sing for Sara Lou Harris, model and half of the radio show, "Sara Lou and Buddy Bowser," of Radio Station WLIB in New York. The boys have just recorded new sides for Victor Records. Their version of "I Wanna Know" was a smash hit in the rhythm and blues field. Sara is one of the stars of the new radio show "Ruby Valentine," soon to be heard around the nation. Left to right: Willie Ray, J.C. Ginyard, Harvey Ray, Bob Carnegie, and Sara Lou.